It’s easy to make this call about a word that’s so loaded, isn’t it? In our culture “sin” has come to be associated of judgementalism, arrogance, hard-heartedness and “religious” people. Some of those people, who lack full awareness of their own failures, think they’re doing others a favour when they call them out for the wrong things those people might have done. But does that mean the word “sin” should be tossed in garbage? The person who created the graphic that inspired this essay might shout YES. I suppose it’s easier to think everything is relative and there is no real “good” or “bad” that would necessitate a word like “sin”. Do you really think that’s so? Isn’t murder a sin? What about setting someone’s house on fire — can you think of a reason that would condone arson? Is there an excuse to justify printing and distributing counterfeit money? I’m tired of putting up with the slow truck ahead of me, so I dangerously cut off another car in the passing lane to get around it. I find pathetic excuses to stay on the computer when I should be turning it off and helping my wife clean the house. I allow ancient, petty squabbles with my relatives to bubble up and stop me from reaching out to them. 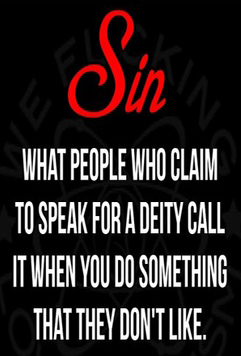 Maybe these aren’t “sins” to you. Our culture might come up with softer descriptions like “shortcomings” or “mistakes”. To me, a shortcoming is not being able to resist sugary snacks (I’m absolutely guilty). A mistake is failing to notice a typo in a Frank’s Cottage essay (often guilty). A sin is different and I hope the bullet-point examples above make that clear. So what can I do about these sins and many others? Lord knows, I’ve tried and tried to change my ways. I’ll bet you’ve tried to fix your sins, too. And I’ll bet you’ve had as much success as me. Kinda sad, eh? But there IS something real and substantial and meaningful that we can do. I’ve done it and it IS making a difference. Not as quickly as I (or my wife) would like, but the change is happening. Prepare yourself for what this is, because it’s radical and controversial: believing there is a creator. A creator who knows YOU. A creator who cares about YOU. A creator who is involved in this world and wants to be involved in YOUR life. Furthermore, this creator has a son, whom He offers to this world (including YOU) as an extraordinary, life-changing gift. He is Jesus Christ and God wants YOU to accept the gift of Him. When you do that, you come to know that He died on a cross to make up for ALL the sins of EVERYONE who believes in Him and follows Him. When this life is done and you come before God, He no longer sees your sins. He sees the sacrifice and the perfection of His son. Sound interesting? Post your thoughts below and let’s have a conversation. I think so many problems in the world today are caused by those who would change the word “sin” into some politically-correct term. It is what it is. If none of us ever sinned, why would we even need a Savior? Praying for the lost to be found. Just going to throw some things out … I think Martha has a point. Sin is what we are born with. Like a disease. Diseases have symptoms, the symptom of sin is sins – the actual acting out. There may be various symptoms and degrees of symptoms, but that doesn’t change the underlying cause, the disease. Thanks for reading and commenting, Robin. I’m with you all the way.